Okay, I may be a little biased... But, this was such a fun project to work on, I couldn’t wait to share a behind-the-scenes sneak peek with y’all. 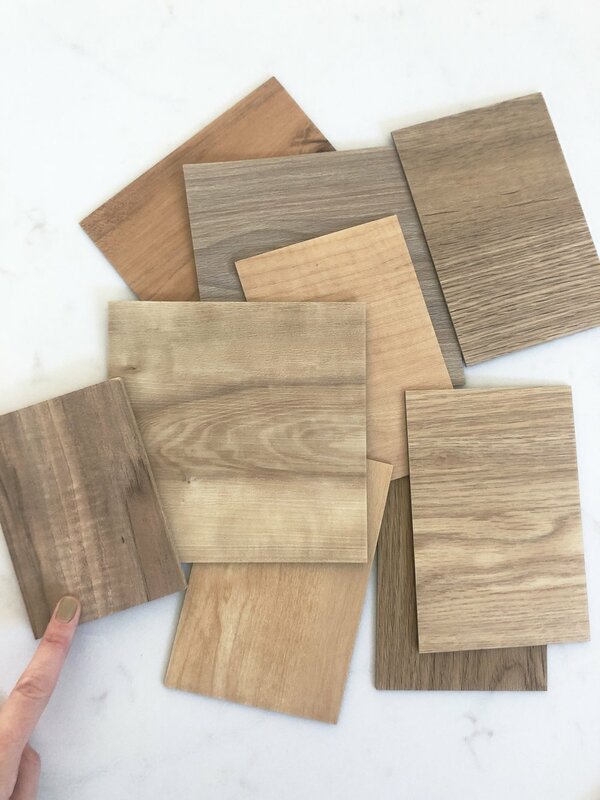 This summer Robin reached out to me, asking if I’d be able to help her decide on the finishes and overall feel of her brand new business off 290 in South Austin. After 23 years of dreaming, she had finally decided to open her own pilates studio. I work out at IronSmith Fitness, just next door to her new studio, and had been introduced to Robin previously when my trainer had recommend her as a massage therapist. She is such a sweetheart, and extremely talented—working together was a no brainer. Honestly Robin already has such great taste. She had already given a lot of thought to how she envisioned the space, so my role was mostly guiding and reassuring that vision. 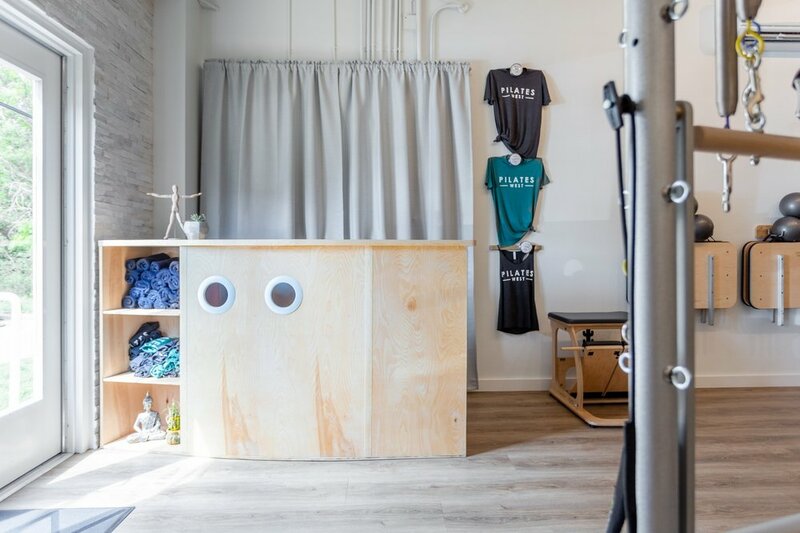 The overall vibe we wanted to achieve was a relaxing, calming and clean space that felt comfortable and allowed clients to focus on their fitness goals. Durability was an important design aspect for this commercial design project. Of course, being a work-out facility, I had to keep in mind the flooring would be the most trafficked item. So, we opted to go with a darker finish to help disguise any future blemishes and scuff marks. To highlight the beautiful, high-end equipment, it was also important for the space to feel light, bright and open. White walls were the obvious choice, and then we complimented the floors with light birch and white wood finishes on the reception area and bench seating. One of the best scores for this project were the large wall-to-wall mirrors Robin found from a gym that was going out of business. 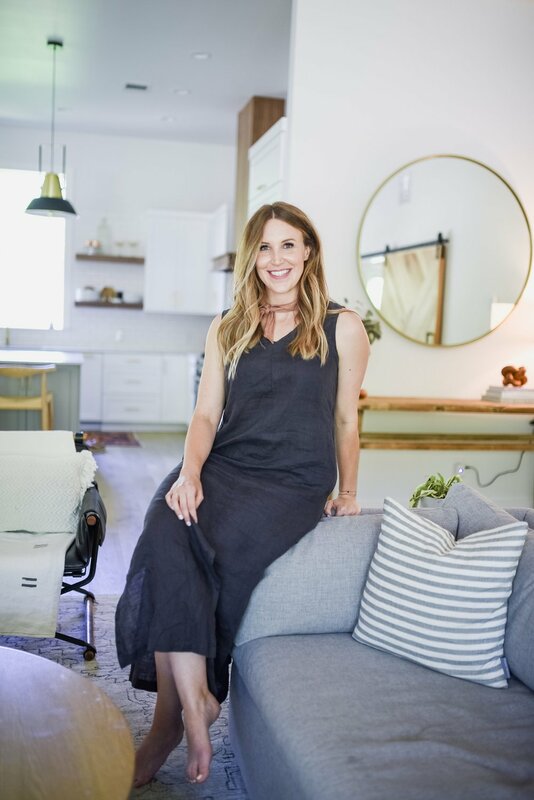 This was going to be a big-ticket item for the space, so the fact that she found them for a fraction of the price really made a difference on her overall budget. Super lucky find! Another statement piece in Pilates West has become the gorgeous reception desk built by Robin’s husband. He created built-in trash and dirty towel bins, and a water dispenser to help create more functionality in the space. I wish I could take credit for this piece, it is seriously ingenious! The birch wood finish also does a great job of attracting the eye when you first walk in, making the check-in process hassle-free for newcomers. But my favorite part of this project probably has to be the accent walls lined with stone. From our initial consultation, I knew it was important to Robin to have a fun, textural element on the front and back walls of the studio. So, we ended up choosing this gorgeous marble wall tile that Robin discovered at Home Depot. It really warms up the space, don’t you agree? 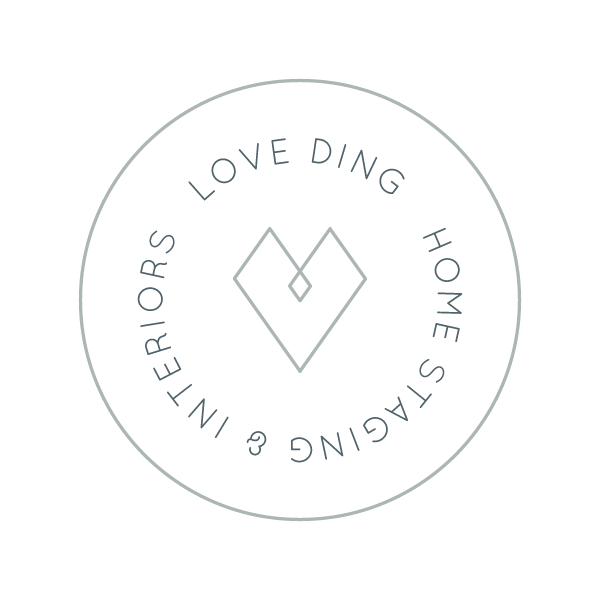 I had so much fun working on this custom commercial design project, and love that I was able to help Robin achieve her dream pilates studio in South Austin. If you’re looking for a fun new way to improve your overall fitness and flexibility, or have always been interested in trying pilates, be sure to stop by Pilates West for a class or private session! Older PostBEHIND THE SCENES | LOCALE "APARTHOTELS"